In vitro systems of purified microtubules and motor proteins offer a greater degree of biochemical control compared with living systems. Can bulk microtubule network contractions be recapitulated with purified motors? In collaboration with Richard McKenney at UC Davis and Claire Walczak at IU we're studying collective behaviors of microtubules and motors proteins. We discovered that networks composed of stabilized microtubules in Xenopus oocyte extract undergo a spontaneous contraction on the millimeter length scale, due to the clustering of microtubule minus ends by the motor protein dynein. In collaboration with Michael Shelley and Sebastian Fürthauer at NYU, we developed an Active Fluid model that can quantitatively describe the contraction process. Fluorescence Lifetime Imaging Microscopy (FLIM) is a spectroscopic method where changes in the lifetime of a fluorophore are used to infer changes in the fluorophore's local environment. How can one cope with noisy FLIM data? One approach is to use Bayesian inference to combine measured data with knowledge about the system. I helped to develop and test a FLIM analysis technique based on Bayesian statistics, which can be used to accurately infer fluorescence decay parameters in noisy regimes. This approach was then used to develop a technique to measure polymer assembly in cells and cell extracts. Spindles are biochemically complex environments where many different kinds of motor proteins act in concert to organize dynamic microtubules. What framework can be used to understand the collective effects of these motor-microtubule interactions and to understand effects on the spindle scale in terms of the interactions between individual components? 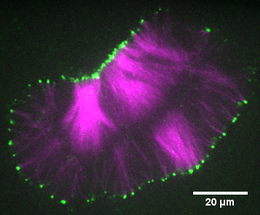 ​Microtubules in the spindle are organized by molecular motor proteins. Outside of the spindle these same motor proteins can organize microtubules into a wide range of structures, from asters to "bilayers". What is the detailed structure of these assemblies and what rules of interaction between microtubules give rise to these distinct morphologies?